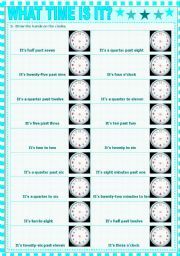 This worksheet contains a brief grammar-guide of the use of the verb to be (present tense). I have included many exercises to practice it. Hope you like it!!! Thanks for downloading!!! 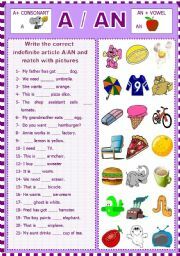 Students have to fill in the blanks with A/An in order to learn the indefinite article and at the same time they work on basic vocabulary matching sentences with pictures. Hope you like it! Thank you for downloading. Students have a grammar explanation in order to understand the use of Present Simple and Adverbs of frequency with Present Simple. There are four exercises to practice 3rd person singular, adverbs of frequency, negatives, questions and answers. I hope you like it! Thanks for downloading. 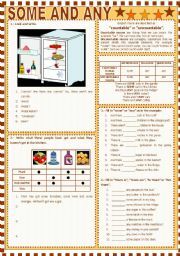 This worksheet contains a brief grammar explanation about the use of some/any and countable/uncountable nouns and four exercises to practice. Hope you find it useful! Thanks for downloading!!! 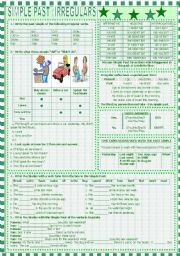 This worksheet contains a brief grammar-guide of the use of irregulars in the simple past. I have included many exercises to practice it. Hope you like it!!! Thanks for downloading!!! 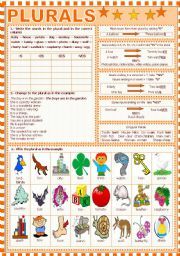 This worksheet contains a brief explanation and some exercises to review plurals. I hope you find it useful. Thanks for downloading. 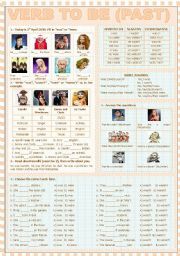 This worksheet is a brief grammar guide of the Simple Past. I have added many exercises to practice the grammar explanations. I hope you find it useful. Thanks for downloading!!! 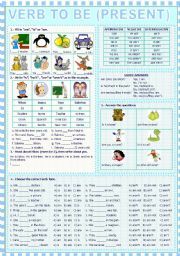 This worksheet contains a brief grammar explanation and five exercises using the simple past of the verb TO BE. Hope you like it and thanks for downloading!!! 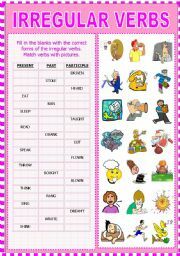 Students have to fill in the chart with the correct forms of the irregular verbs. Once they have finished they have to match verbs with pictures. Hope you like it!!! Thanks for downloading. Second worksheet to practice the time.Some time ago I uploaded a nice powerpoint related to the topic with exercises in the last slide. http://www.eslprintables.com/powerpoint.asp?id=19315#thetop. Thanks for downloading!!! This is my first ppt contribution. It is addressed to students who are learning to tell the time. There are some examples and the last slide is plenty of exercises. I hope you like it! This is a nice game to teach vocabulary related to the weather. There are 11 multiple choice slides and if they don�t know the answer they have to begin the game again. Special slide at the end of the game where students are congratulated if they guess all the correct answers. I hope you like it! This power point is a contribution of one of my students, Ana. All the class took part in a contest and her presentation was the most voted. I�d like to share it with all the community because she�ll be very happy to see it here. I would really appreciate your comments on it. This power point is a contribution of one of my students, Javier. All the class took part in a contest and his presentation was the most voted. I�d like to share it with all the community because he�ll be very happy to see it here. I hope you like it!